January Picture – A – Day. Some days are easier to come up with a shot than other days. I generally purposefully find a shot to shoot in black & white rather than just take a picture and change it later in Photoshop. Since starting in August, I’m going 6 months strong. I’ve been a life long analog (film) shooter. Ninety percent of the film I shoot is black and white. I’ve always enjoyed and appreciated shooting in black and white. There is something about seeing an image and visualizing it in bw. Since moving to shooting digital, I’ve lost some of that sense of visualizing the image in bw. I never lost it but shooting so much in digital (color) it was not part of my daily routine. It’s been about 3-4 years now that I’ve seriously gotten back into shooting bw film. I’ve had several personal year long projects the last few years where I shoot with my collection of analog cameras with film. In my collection I have many 35mm, several medium format, 2 4×5 Graflex’s and a 5×7 1908 Seneca camera. I won’t go very far without an analog camera. What I’m doing is not a new thing I know, but I recently combined my love of shooting in bw with my daily routine of shooting with a digital camera. Each and every day I intentionally look for an image to shoot in monochrome, I go into the menu setting on my camera, Photo Shooting Menu, Set Picture Control, MC Monochrome and create the image. Please let me know your comments on my newest project A Monochrome a day. It did not take long to figure out that it was going to be a long year if I could only shoot and document 12 cameras. I decided to shoot 2 cameras a month of 26 cameras total (every 2 weeks). SO … next up is the classic Yashica GSN. 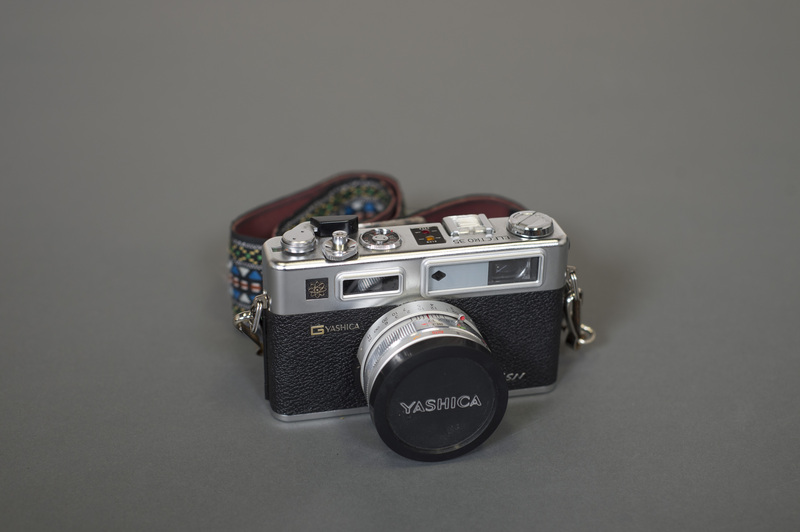 It’s a classy stylish 35mm rangefinder. I’m looking forward to putting another roll of film in this camera. I was going to change this image into BW put the colors in the classic 70’s camera strap kept me from doing so. I had a great time with the Pentax K-1000, it is such an easy camera to use. I will keep the Pentax close and ready for service. I’m looking forward to showing some results.